THE LAST OF A CUNARDER. 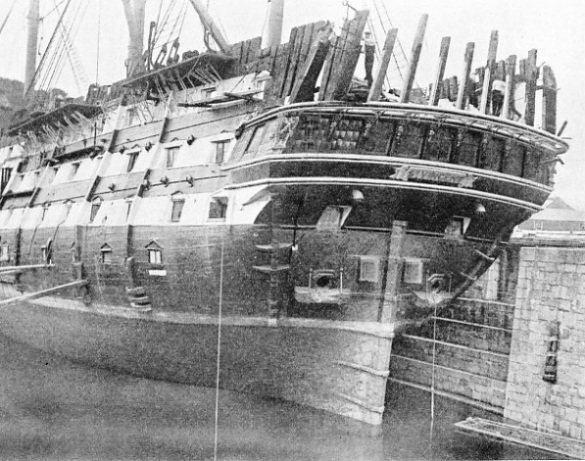 The Servia, 7,392 tons gross, was broken up at Preston, Lancashire. She was built for the Cunard Line in 1881 at Glasgow. Her length was 515 feet, her breadth 52 ft 1-in and her depth 37 feet. Many old established businesses, engaged solely in shipbreaking and the disposal of the material, have extensive yards provided with the most up-to-date equipment. The industry has been revolutionised by the introduction of the oxy-acetylene burner, which cuts through steel plating as if it were butter. THE business of shipbreaking is one of the numerous industries which have grown up round shipping and the sea. It was apparently first practised in the dismantling of ships which had been driven ashore in bad weather. Those who had the legal right to a wreck, and often those who had not, used the materials for building their huts ashore or for any other purpose. Shipbreaking as an industry does not appear until a later date, but in Tudor days it was the regular practice to break up worn-out warships in the dockyards and to work all the material that was still serviceable into new hulls. The frequent shortages of seasoned timber, especially in wartime, made this practice necessary and it saved infinite trouble and labour with primitive tools in the making of new parts. Many of the ships so built, however, showed weakness from the first. When there was no shortage of material, and the ships could be carefully and leisurely built, it was not as a rule worth while breaking up a wooden ship. She was generally taken to some quiet spot and left to fall to pieces with the minimum of trouble to her owners. Even naval ships were sometimes treated in that way and to the present day small vessels and barges which have no sale value will often be carefully “lost” in some out-of-the-way corner. Harbour masters and conservancy authorities are careful to check this practice wherever possible; but even the Port of London Authority, responsible for the best-controlled port, in the world, often has trouble in stopping it. As a rule, however, even the oldest ship has some value - in Great Britain, at least. There are many old-established businesses engaged solely in shipbreaking and the disposal of the material. This latter part of the business calls for great ingenuity. One of the pioneers was the firm of Castle, which started its shipbreaking business at the Baltic Wharf at Millbank on the Thames in 1838. The firm specialized in the breaking up of wooden warships there and as the size of ships increased, farther downstream. Turner’s famous picture “The Fighting Téméraire” shows that ship being towed to Castle’s yard. The timber of old, wooden warships, especially hard oak and teak, makes excellent material for garden furniture. It has wonderful weathering properties and is almost everlasting, needing neither paint nor varnish. It can be put to other purposes as well, as it was in 1922 when Liberty’s, of London, rebuilt their premises and made excellent use of the oak from the old training ships Impregnable and Hindostan which had been broken up on the Thames. For many years Castle’s took the greatest care of the figureheads of the ships which they broke up. When, after a long period of neglect, the Admiralty suddenly realized that such trophies were of great value to the morale of the Service, it was enabled to make the famous dockyard collections principally through the co-operation of the scrappers. A number of figureheads are still to be seen at Millbank, and others have gone to museums all over the country. The late King George V was particularly interested in relics made from the material of old ships. On the breaking-up in 1910 of the cruiser Melampus, which he had commanded when he was Duke of York, he had a garden chair made from her teak for his own use and a suite of garden furniture for Queen Alexandra. Even today there is a big sale for articles, large and small, made from man-or-war teak; but in modern ships this material is virtually confined to the deck. Shipbreaking can he practised only where the conditions and labour are suitable. In the countries where these are not suitable the merchants have to rely on imports, and a surprising number of ships are employed carrying full cargoes of the materials of their predecessors. In the United States, where labour costs are excessive, shipbreaking can be done only when the ship is of a type which lends itself to mechanical treatment. Wooden ships do not, and for a long time it was a usual American practice to recover all that was really worth while from a wooden ship by burning her. She would be stripped of the fittings, which were easily removed and then towed inshore at the top of high water, at a spot where there was a large rise and fall. She was then set on fire, generally assisted by barrels of tar or some such fiercely burning material, and by the time the ebb had finished there was little more than a heap of ashes left on the foreshore. From these the metal fastenings and the copper sheathing could be collected with little difficulty and sold for further use. Even in countries where labour is cheap, the materials of wooden ships could be profitably used again only when they were of oak, teak or similar timber. The majority of ships were of soft wood, which did not last for any time as garden furniture, but these were cut up into small pieces. Before the war of 1914-18 the shipbreakers could generally get £2 a ton for such wood to be burned as logs in open hearths. While labour was cheap this would show a reasonable return when combined with the sale of the metal fittings, hut the price paid to the owners had to be low. When ships built of iron or steel began to wear out, the business altered completely. It was impossible to break them up with the primitive tools of the wooden scrapper - in some old iron men-of-war it was necessary to use explosives - but the material that could be melted down and re-rolled into ship plates fetched a sufficiently high price to justify a good deal of expense. In the early days of that side of the industry it was by no means an easy task to break-up a metal-hulled ship, hut labour was cheap and the greater part of it could be practically unskilled. WEST COUNTRY “WOODEN WALL”. H.M.S. St Vincent was built at Devonport in 1815 and was broken up on the Thames in 1906. She had a length of 204 ft 11-in, a beam of 54 ft 7-in and a displacement tonnage of 4,672. The timber of old wooden warships, especially hard oak and teak, is almost everlasting and needs neither paint nor varnish. It makes excellent material for garden furniture, and can even be incorporated in the structure of a new building. 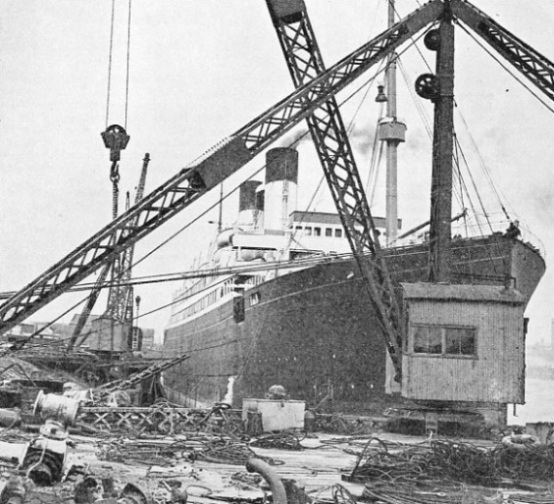 Great Britain had a big start over her competitors in iron and steel shipbuilding on account of her natural resources, and many of the foreign shipbuilders were glad to buy British scrap to work into their new construction. Well over fifty years ago Denny Brothers of Dumbarton started to use forgings of scrap steel for their new ships and found that it answered perfectly. They began making the stems of all their seagoing steamers, a part of the ship which demands great strength, of scrap steel. They soon extended it to other parts, experimenting until stern frames up to a considerable weight could be made of scrap steel without difficulty or risk. Other firms followed suit and nowadays the accurate blending of the right proportion of scrap with new metal is one of the most scientific parts of the work of the metallurgist and is not only practicable but also economical. The proportion of scrap varies with the properties of the metal with which it is mixed, so that the demand of some countries is more than that of others, and it is subject to the fluctuations of the various industries which use scrap. The current price of scrap steel is bound to have a big influence on the plans of the shipowners and shipbuilders. When the price is low the owners keep their ships running as long as they can and do not order so many new ones. The British scrapping industry was the pioneer, but it was gradually copied in other countries which wanted materials for shipbuilding and other purposes and had little or no natural supply. Many of these countries evolved most ingenious methods of using the scrap in new manufacture, and in the years preceding the war of 1914-18, as well as in more recent times, Holland, Germany, Italy and Japan bought large numbers of obsolete British ships to break up. The Italian industry which has attained large proportions, started in 1892, and the Japanese after the 1896 subsidy law had been passed to encourage the native shipbuilding industry. Sometimes the shipbreaking companies were in a position to run their ship with a last cargo to the country which had bought her, but the majority were bought with delivery in England and were taken out by a temporary crew of runners. Those going to Italy were usually loaded with a cargo of coal, which went a long way towards paying the expenses of delivery even at the lowest freight, and more than one came to grief on the way out. The owners of liners which had made a great name for themselves on the passenger services were anxious that the public should not identify them with a final disaster and frequently insisted that the names should be changed before they left a British port. The simplest way of doing this was to chip off the final letter of the name with a chisel so that many ships have made their last voyage under curious tallies. THE AFTER END of a famous battle cruiser H.M.S. Lion. The flagship of Admiral Beatty at the battle of Jutland, she was among the warships scheduled for scrapping under international treaty. She was cut in two at Hebburn (Co. Durham), and the stern part was towed down the Tyne to Blyth (Northumberland), to be broken up. Because of a heavy ground swell, the stern part broke away from the tugs, but it was picked up again and the destination was reached. The photograph shows the crew hauling in the broken tow rope. H.M.S. Lion, completed in 1911, had a displacement of 26,350 tons and a speed of 30 knots. She was armed with eight 13.5-in and sixteen 4-in guns, in addition to two torpedo tubes. Nowadays the British shipbreaking industry is run on the most scientific lines, and many big firms are engaged in it. A large amount of capital is sunk in the business. Extensive yards have been acquired and given the most up-to-date equipment, and a body of skilled and semi-skilled labour has been collected. Formerly ships were broken up in dry dock whenever one was available, but that was expensive and nowadays this is done only in exceptional circumstances. 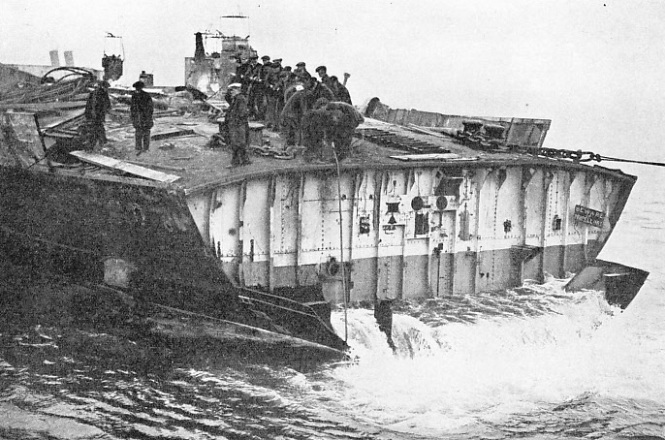 The German ships salved at Scapa Flow, for instance, are towed bottom upwards down to the dockyard at Rosyth, which is now almost disused, and there dealt with in one of the dry docks left idle by the departure of the fleet. As a rule the shipbreaking firm carefully selects the position of its yard, used exclusively for the purpose, with many factors in mind. It must be as handy as possible to the steel works to save transport expenses, for railway rates are heavy on pieces of any size and it is costly to handle them. 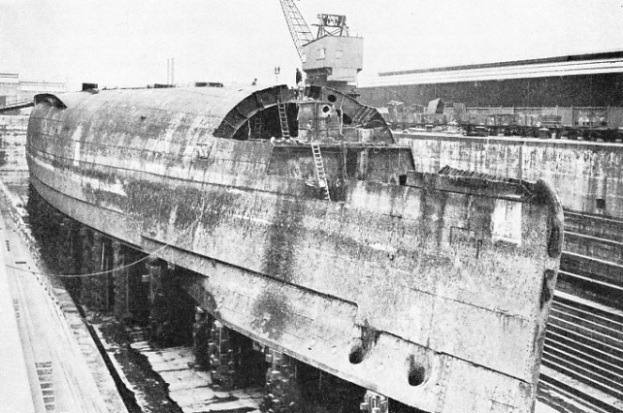 The site must have a foreshore as long as the ships to be scrapped, and at high water sufficient depth for them to be floated in, although this demand is reduced by making the ship as light as possible and then driving her ashore at full speed. This is an impressive sight and the fact that it ruins the bottom of the ship is of minor importance. It has to be broken up anyhow. A 10-feet rise and fall of tide is necessary, at least. The foreshore must not be exposed to the full force of the waves or the work would frequently have to be suspended. The best bottom is one that is hard and shelving, while the longer it dries at low water the better. These are the ideal conditions, but it is not always possible to find them in a convenient situation. In contrast to the tools used in the old wooden scrapping yards, the equipment of a modern establishment is exceedingly elaborate and expensive. The first necessity is plenty of power, for many of the machines are ponderous by the nature of their work. Big electric motors are the favourite sources of power. Plates of hard steel up to 2-in in thickness, and about 8 feet long, are within the power of the big shears, which cut through them with remarkable ease. Shell plates that can be detached from the hull entire and swung into the yard are there cut into convenient pieces. Sections that are too large cost much to transport but the breakers do not want to do any more work than is necessary for economy. There is usually a good deal of cast iron in a ship, especially in the engine room, and this is still broken up into convenient pieces by the methods that have been in vogue for three-quarters of a century. A heavy ball, made of some material which is not easily fractured, is suspended on a wire to a jib of considerable height. Steam is the simplest means of hauling it up to the top, where it depresses a trigger. The winch barrel is then declutched and the ball comes down with a crash on the cast iron to be broken. The dropping ball, as it is called is the principal reason for the vicinity of a scrapping yard being an undesirable residential quarter. The industry has been revolutionized within recent years by the introduction of oxy-acetylene burners, which cut their way through the steel plating as though it were butter. They are extensively used in every yard, although their introduction led to a good deal of labour trouble, for the operation of a burner needed only two men instead of a gang of about twenty-five by the older methods. FATE OF A FRUIT SHIP. The Jamaica Planter, shown at Bo’ness, West Lothian, was one of the fast banana ships engaged in the fruit trade between British ports and the West Indies. Formerly the Highland Loch, this vessel was built in 1911 at Birkenhead. Her length was 413 ft 9-in, her breadth 56 ft 2-in and her depth 27 ft 1-in. Her gross tonnage was 7,482. She was owned by the Jamaica Banana Producers Steamship Co. Ltd. The use of these burners in foreign yards left no alternative to their adoption in Great Britain, and now it would be quite impossible to break up a steel ship economically without them. The shears and the oxyacetylene plant are used for cutting the scrap into convenient size for the ordinary steamer would load badly with the bigger pieces, and the railways probably would not consider carrying them at all. Tramps are almost invariably used for the transport of scrap and the charterers want to get the utmost use out of the tonnage for which they are paying. A ship making her last voyage to one of the shipbreaking countries in Europe, or even out to Japan, will often take a cargo of scrap from other ships, but the demand for transport is far too big to be completely satisfied by that means. In the old days there was an appalling waste in the process, for as a general rule the shipbreakers were interested only in the steel or metal for which they had a market, and anything else was disregarded. Really fine furniture, good for many years’ service, was either smashed with an axe and fed into the furnaces, or else given as a present to anybody who cared to take it away. Many a waterman round the yards, made welcome to any odd thing that he cared to take away, has found a good market for it ashore. That, however was in the old days. Among the pioneers or the more efficient system of to-day was Thomas W. Ward, Ltd, whose business was founded by Thomas Ward at Sheffield in 1878. To begin with he was interested only in steel, but he loathed waste and set about eliminating it. Gradually the organisation grew until it is now one of the biggest in the industry. The firm has scrapping yards at Preston, Morecambe (Lancs), Grays (Essex), Milford Haven (Pembroke), Inverkeithing (Fife), Briton Ferry (Glamorgan), Hayle (Cornwall) and other places. With this magnificent organization the firm copies the example of the Chicago pork packer who boasts that he uses every part of the pig except the squeak. Every section formerly wasted is put to good use. The furniture has its regular market ashore and afloat. Many a tug or small passenger steamer carries the washbasin of some Atlantic queen of the past. Every item of auxiliary machinery - motors, pumps, and hundreds of other machines - is carefully taken down, cleaned and reconditioned by experts and sold for many years of further use. The other firms in the industry all work on the same system nowadays, with results that depend largely on the size and organization of the firms, but everything is carefully priced. The old sailor who wants a ships bell to hang in his hall, as so many old sailors do, no longer gets it at so much a pound for old bronze. Recently there has been an additional method of finding a market for everything, and that is a well-advertised sale by auction or private treaty of everything that is portable, before the ship goes to the scrappers’ yard. This was done with the famous Great Eastern nearly fifty years ago, and with one or two other particularly well known ships; but the custom was then allowed to lapse for many years. It was revived when the famous Cunarder Mauretania went to her last berth. Most people in Great Britain, and many people in the United States, were keenly interested in the old ship and an auction sale of all her furniture and fittings, lasting for several days, brought big prices. The ship herself was nearly thirty years old, but her furniture had been kept right up to date and as soon as there was any sign of wear it had been replaced by new. AT NEWPORT, MONMOUTHSHIRE, the Cunard White Star liner Doric waiting to be broken up. 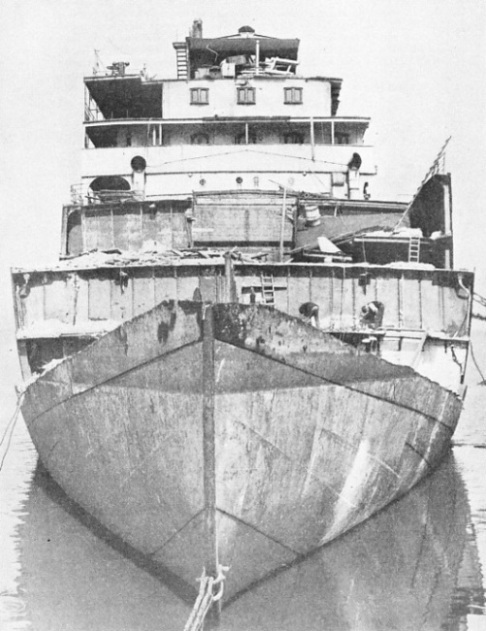 The Doric was involved in a collision off the Portuguese coast in 1935 and her passengers were rescued by the Orion. Obsolete men-of-war always contribute a large proportion of the material that comes on to the scrapping market. The progress of warship design is so steady, and the competition so keen, that the older ships are always going to the shipbreakers in a steady stream. Even when international agreement periodically postpones the bigger ships being cleared off the list by giving them longer agreed lives, the smaller vessels go to the yards in undiminished numbers. The scrapping of men-of-war is always worth while, so that there is the keenest competition to get hold of them. Before the war of 1914-18 they were collected in batches in one or other of the anchorages popularly known as “Rotten Row” and periodically offered for sale by public auction. The bidding was supposed to be strictly controlled, certain ships being reserved for national buyers only, whereas others, of smaller importance, could be bought by anybody. The modern routine is quite different. All the sales are conducted by private treaty and any question as to the price realized, whether it is raised in Parliament or outside, is always met with the statement that its divulgence would be against public policy. In spite of the change, the scrappers are still as eager as ever for any warship that is on the market. There is a big weight of steel in her hull, and the breaker can usually rely on getting 60 per cent of her displacement in heavy scrap, and 10 per cent in light scrap. The proportions vary with the type of ship. Brass, copper, lead and cast iron are also yielded in considerable quantities, and the carefully-built water-tube boilers and heavy bearings, all of the best metal to be obtained, show good profits. The Admiralty takes precautions against Service secrets being divulged by the sale of ships. All gear of a confidential nature, especially that connected with gunnery control, is carefully removed. A good deal of it will be useful in other ships, but almost the same care is taken even if it is obsolete and useless. After the Armistice there were hundreds of men-of-war to be disposed of, as well as a large number of merchant ships which had been kept in commission beyond their normal life owing to the war boom in freights. Shipbreakers did well out of the business, but there arose a craze for scrapping and a number of mushroom concerns sprang up all round the British coast. The price of a ship for scrapping is usually fixed at so much a ton gross for a merchantman and so much a ton displacement for a man-of-war. The expert eye of the scrapper assesses her value remarkably quickly - bronze propellers, metal in the engine-room, furniture that can be used again and a hundred and one other items. When there was a glut of steel on the market, and the price was depressed, many shipowners who were hard hit by the slump were obliged to sell their ships for as little as six and seven shillings a ton gross, about the lowest level in the history of the business. As industry revived, so the price revived as well, the passenger ships being always just a little ahead of the cargo vessels. The £78,000 given for the Mauretania worked out at £2 10s 10d a ton, gross, and the £100,000 which was given for the Olympic was £2 3s 0d a ton. If £2 a ton gross is given for cargo vessels the market is in a flourishing state. Shipbreaking is an industry which has grown vastly of recent years and has every chance of further expansion as the demand for steel appears to get bigger and bigger. To the lover of ships there is always something sad about a scrappers’ yard where a beautiful vessel is ruthlessly cut up into lumps of dead material. UPSIDE DOWN IN DRY DOCK. The German battleship Konig Albert at Rosyth, Firth of Forth. This warship, completed in 1913, had a displacement tonnage of 24,120 and a speed of 21 knots. She had ten 12-in, twelve 5.9-in and fourteen 3.4-in guns, in addition to six torpedo tubes. She was among the German warships scuttled at Scapa Flow in 1919. Raised by Metal Industries Ltd, after an immersion of nearly seventeen years, she left Scapa Flow on April 29, 1936, for Rosyth Dockyard. In Germany, numerous British warships sold for scrap have been broken up at the old Imperial Naval Dockyard at Wilhelmshaven. You can read more on “Dramas of Salvage”, “Ship Surgery” and “The Ship That Broker Her Back” on this website.